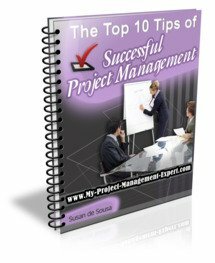 An important part of any Project Management Report are the Project Milestones which are detailed in the Project Management Plan. 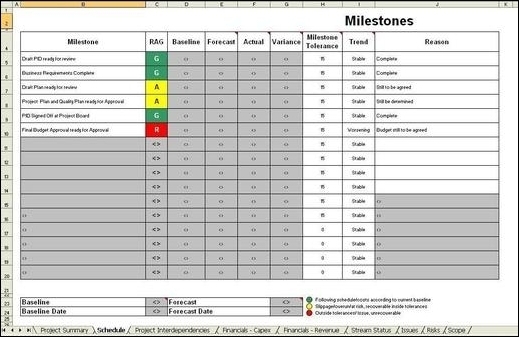 In your Project Plan you will have detailed a number of defined Milestones. These are essentially markers in the sand by which progress can be judged and ensure that if your project is in danger of not delivering, this problem is picked up early enough to ensure it can be dealt with. It further should detail when important phases of the Project life Cycle conclude, for example the end of Requirements, or the end of Development. Below please see an excerpt of a Project Management Report and what you might be asked to report in the Milestones section. As you will see, this is reported in much the same way as the Project itself via the RAG (Red, Amber, Green) Statuss. Please note that if any Milestone is in Red this means that it is outside Tolerance and Unrecoverable. That means it will be impossible to ensure the Milestone date is met even if the tolerated slippage of 15 days is taken into account. The Amber status means the Milestone is currently outside Tolerance but it is recoverable. This is the date stated in the current baselined plan held by the PMO. Please note that you could keep a careful note of the version number of the plan you have baselined with the PMO. Ensure you put this into your report in the Baseline box at the bottom as this will ensure the PMO are comparing your report to the correct version of the plan they hold. This is the date the Milestone was actually completed. This is the amount a Milestone can slip before it becomes a problem. This is usually stipulated in the PID and Quality Plan. In the example above this is set at 15 days tolerance but often this is set to just 10 days slippage. This shows whether the delivery date of that Milestone is becoming more or less achievable. Please note once the Milestone has been delivered the Trend should not be changed. In this section you should state any reason why a Milestone is slipping or has been missed. When it comes to the Project Schedule and Milestones, it is best to ensure there is as much contingency as possible in these. So for example if you think a piece of work will take 10 days to complete, try to put it down as 15 days. This means in theory that your milestones will always be in Green and you will deliver ahead of schedule. The flip side is that if things go wrong, as they always do, youve given yourself additional contingency to rectify matters before you are dragged in to explain yourself to those higher up the reporting line!